Supply your hotel with branded door hangers and do not disturb signs. We design and print hospitality signage to make your guests stay more memorable and hotel profitable. 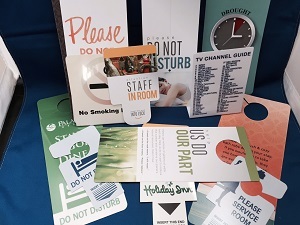 Choose from a wide variety of hospitality signage: door hangers, do not disturb signs, request service signage and more. Make your guests stay more memorable and hotel profitable. Contact one of our helpful representatives to discuss your custom hospitality signage. Request a quote by calling 888-859-2061. Custom door hangers perform a wide variety of tasks at your establishment. They are not just “Do Not Disturb” signs for requesting hotel privacy. They are a great opportunity for branding and hotel promotion. Our hotel door hangers are made from durable plastic and can be wiped clean. Call Front Desk Supply 888-859-2061 to order door hangers for your hotel today! Any hospitality sign your hotel needs! Every guest sees hotel signage multiple times during their stay. Front Desk Supply focuses on making quality products with a memorable design. Guests won’t forget where they stayed! Because we have graphic artists on staff, printing and bindery in house, we are able to produce door hangers and other hospitality signage quickly and on budget.